The couple purchased the house in 2008. Each has a different reason for loving the home. The husband is an avid hunter and has collected trophies from all over the world. The house offers extensive display space because of the high ceilings and many walls. The wife loves the open floorplan and the flow of one room into the next. It gives her a chance to demonstrate her eclectic design style. 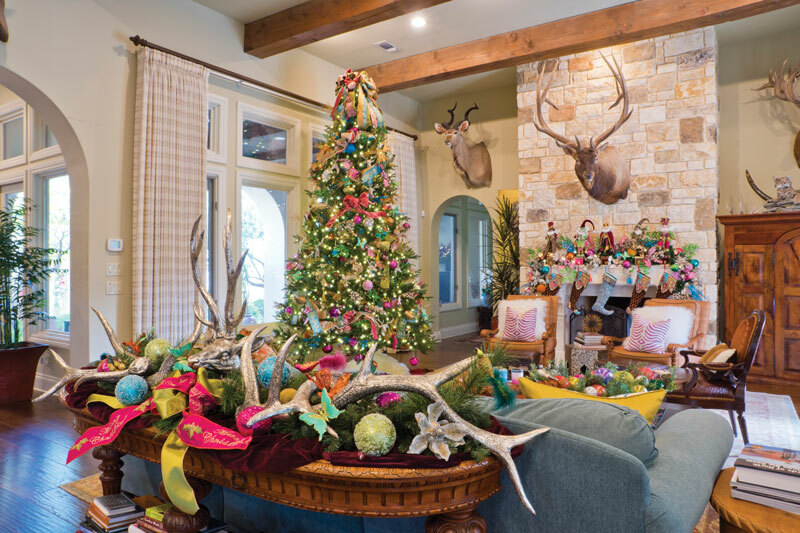 This holiday season, she chose to work with Cheri Stith and Jamie Weyand of Feather Fluff & Flings, an Alamo Heights design firm known for their holiday decorating prowess. The trio began working together in January 2018, before the designers went to market, to purchase holiday decorating pieces for the home. 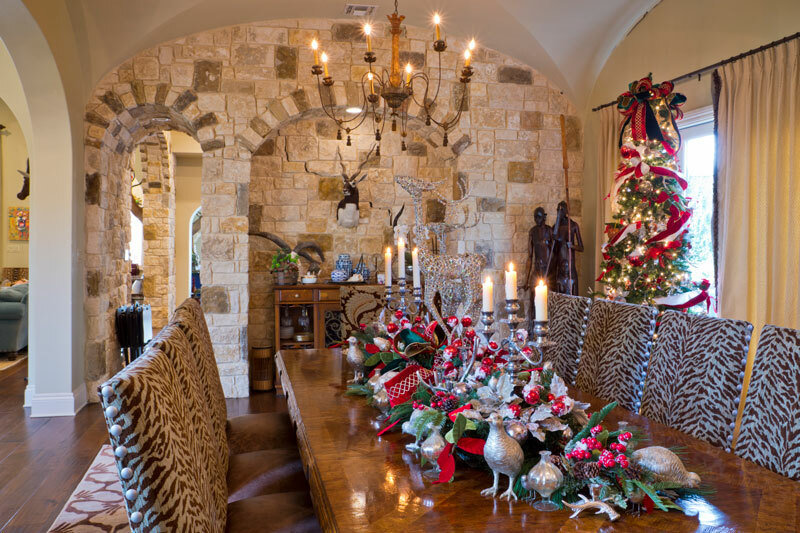 They combined items the homeowner had with new pieces from market to create the glamourous holiday environment. One of the most unusual features of the home is the entry. From the street, visitors are greeted by two wood-and-iron arched doors providing a formidable entry. During the holidays, though, colorful red and green garland festooned with holiday pinecones, glass balls and florals, offer cheerful invitation to visitors. The wreaths with reindeer heads hint at the fun beyond the threshold. 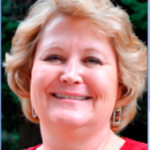 When the front door swings open, visitors discover it isn’t the front door after all! Instead, it opens into a courtyard the homeowners use for entertaining. To access the home, cross the courtyard and step up into an entry niche framed by luxurious garland. Colorful ribbon in red, white, lime green and gold is surrounded by oversized pinecones, glass balls and holly berries in red and green. 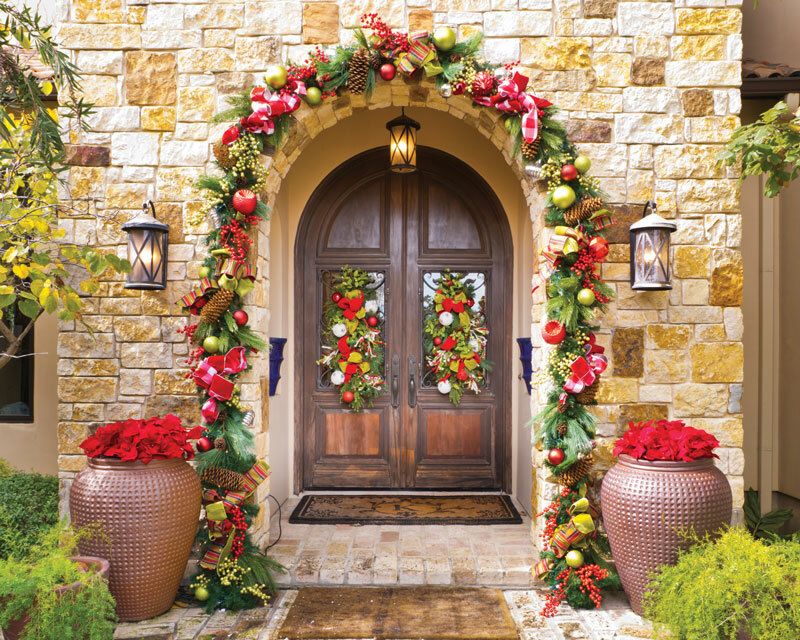 Two terracotta urns planted with red poinsettias flank the doors. Colorful swags hang in the center of each door panel. The foyer’s vaulted ceiling leads the eye up to the pendant light, crowned in red ribbon and nesting in red and green glass balls and a variety of florals and fir. To the right is the staircase leading to the home theater and guest room. The wrought iron railings are hung with axis deer hides and yards of red and gold ribbon folded into luxurious bows. Fir garland weaves around the banister. Poinsettias, gold ornaments, sparkling gold leaves and reindeer heads are affixed to it. A Mark Roberts fairy perches atop the rail, keeping watch on the front door. To the left of the foyer is the formal dining room. The homeowners love to entertain, inviting their families and friends for dinner and football parties. The long dining table with zebra-skin chairs seats ten beneath a groin vault ceiling. Two wrought iron chandeliers are positioned at either end of the table. At the far end of the room is a limestone nook, where a kudu mount reigns over the room. In the corner, two life-size African hunters, a treasure from a village in Africa, stand watch. This holiday season, two nine-foot Christmas trees with zebra skin tree skirts overlook the table scape. Two sterling silver candelabras are positioned amid magnolia leaves, fern and fir, as well as silver holly leaves with frosted red berries. Silver acorns peek out from the greenery, while silver quail roost at the corners. A pair of silver wire reindeer center the decoration. Diagonal to the dining room is the breakfast nook. The arched windows on two walls provide excellent natural light throughout the day. A round wooden table and wooden chairs with tooled leather upholstery provide a great place for morning coffee or venue for visiting children to have dinner under the watchful eye of parents in the dining room. When the homeowner talked to Stith and Weyand about colors for the nook, the kitchen and the family room, she asked for a bohemian color palette. Traditional holiday colors would be used in other rooms but in these, she wanted bright colors placed against the neutral walls and draperies. 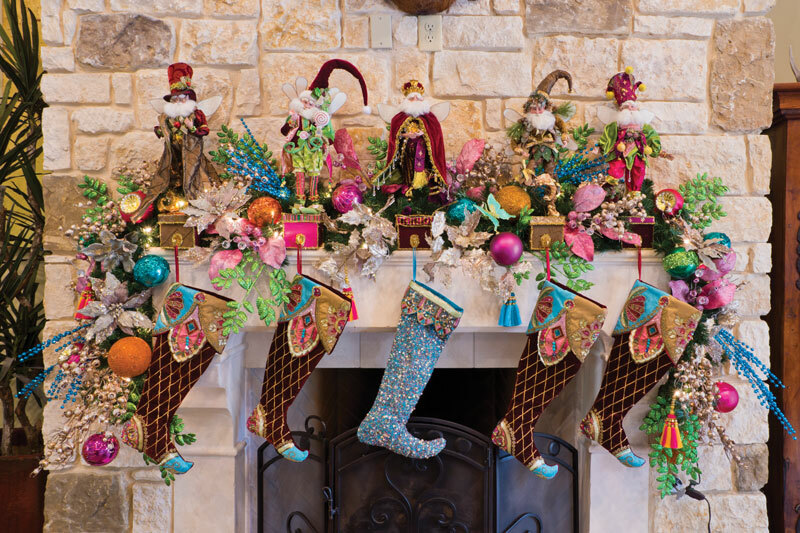 She wanted to build the theme of a turquoise stocking she’d found that had pink and gold accents. The Feather Fluff and Fling twosome took that idea and grew it into glitz in the breakfast nook. The ten-foot Christmas tree is wrapped and bowed in ribbon of turquoise and gold and pink and gold. Animal ornaments, including cheetah, zebra and monkey heads, peek out from the branches. 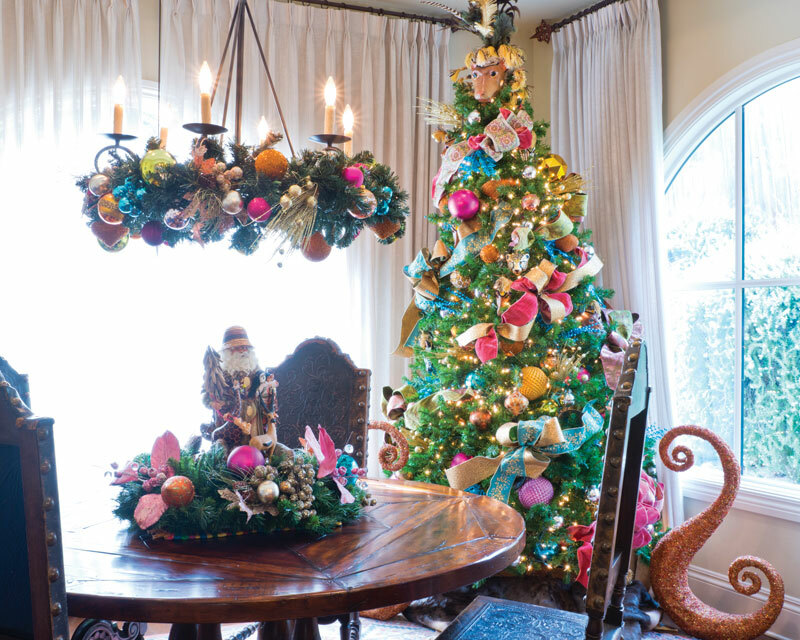 Large pink balls and turquoise picks are placed everywhere and feathers top the tree. The chandelier over the table is wrapped in fir garland with similar ornaments attached. The Santa on the table is also surrounded by garland with sparkling pink leaves and gold berries. The family room and kitchen across the hall combine to make one great room. The kitchen’s barrel ceiling echoes other arches found throughout the home. The homeowners like to entertain and believe in having guests in the kitchen, so the oversized island is perfect for their style. Hidden in the island is a large amount of storage, convenient for oversized serving platters and small appliances. Double ovens make cooking for a crowd easy; one of the cooktops is a grill, while another has a pot filler over the burners. In the nook by the refrigerator is an espresso bar. The family room features a high ceiling with wooden beams that run the width of the room. The stone fireplace runs from the floor to the ceiling. Mounted over the mantle is an enormous stag from New Zealand. A kudu trophy hangs to its left. The pair overlooks a large room filled with natural light from the tall windows around the room. Five stockings hang from the mantle. A Mark Roberts Christmas fairy or elf serves as a hanger for each sock. Tassels, silver leaf garland, turquoise sprays and colorful balls bring the Bohemian theme to life. The 12-foot tree continues the theme. Multiple colors of ribbon are wound through the branches and bows of all sizes are everywhere. Butterflies flit among the giant fir, along with ornaments of every shape and size. Reindeer heads and tassels are hung next to animal skin ornaments. Hundreds of sparkling sprays and picks help make the twinkle lights sparkle brightly. Fluffy white sheepskins surround the tree’s base, imitating mounds of snow. 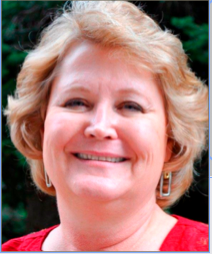 The backyard has a comfortable covered patio with a wooden dining table facing a large wood burning fireplace. Over the mantle is an impressive moose skull and horns. For the holidays, the heavy wooden mantle sports an evergreen swag filled with long stems of red and green holly berries, silver pinecones and a big red and white gingham bow.